Profs. 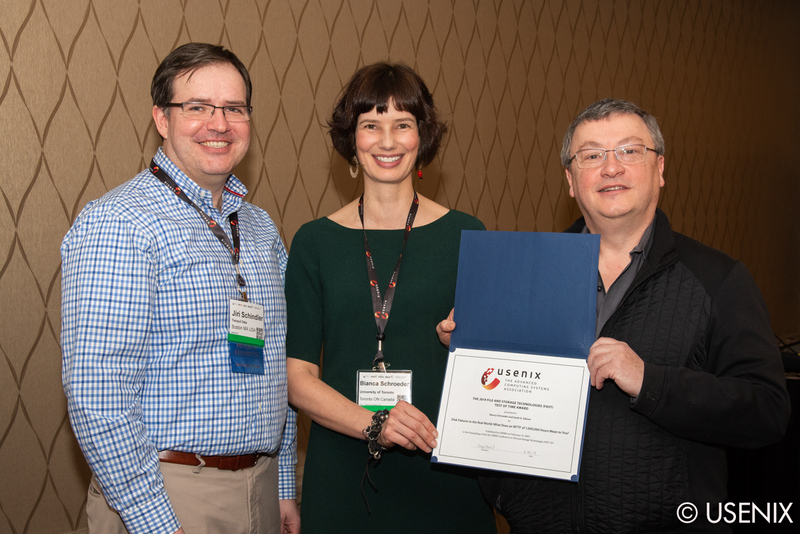 Bianca Schroeder and Garth Gibson receive the 2019 FAST Test of Time Award for their paper "Disk Failures in the Real World: What Does an MTTF of 1,000,000 Hours Mean to You?," originally presented at FAST '07. Alumna Monia Gobadi (PhD 2013) joins MIT CSAIL faculty. Prof. Angela Demke Brown appointed to Usenix Board of Directors. Gennady Pekhimenko to join CSNG Faculty in the summer of 2017. Gennady received his PhD from Carnegie Mellon University, where he worked with Professors Todd Mowry and Onur Mutlu. Profs. Angela Demke Brown, Bianca Schroeder and Eyal de Lara awarded NSERC Research Tools and Infrastructure grant titled "Infiniband-connected Servers for In-Memory Rack-Scale Computing Research." Prof. Angela Demke Brown co-chairs FAST-16. The paper "Towards High Performance Spatio-temporal Data Management Systems" by Suprio Ray (Advisor: Angela Demke Brown) won IBM PhD Student Colloquium Paper Award at the Ph.D. Colloquium, held in conjunction with the 15th IEEE International Conference on Mobile Data Management (MDM), 2014, Brisbane, Australia. The paper "Supporting Location-Based Services in a Main-Memory Database" by Suprio Ray, Rolando Blanco, and Anil K. Goel won IBM Best Student Paper Award at the 15th IEEE International Conference on Mobile Data Management (MDM), 2014, Brisbane, Australia. This prize is awarded to "young computer science faculty members at Canadian universities within 10 years of their Ph.D. who have made highly significant contributions in their careers, particularly to research." This is the second consecutive year that a CSNG faculty member has been awarded the CACS Prize. The Heidelberg Laureate Forum brings together winners of the Turing Award and Nevanlinna Prize (CS), as well as the Abel Prize and Fields Medal (math). The goal of the Forum is to bring together 200 young researchers in Computer Science and Mathematics to spend a week in September (in Heidelberg, Germany) learning from and working with the laureates. This year an international panel of experts selected 100 CS candidates from more than 40 countries around the world. Ph.D. student Suprio Ray is one of the invited attendees. Prof. Bianca Schroeder co-chairs FAST-14. Bianca received this highly competitive award in recognition of the landmark research on large-scale system reliability, the impact of which has been significant both in academia and industry. Faculty members Eyal de Lara and Mike Brudno, and former DCS students Andres Lagar-Cavilla, Adin Scannell, and Joseph Andrew Whitney were named University of Toronto Inventors of the Year. Their software invention, VM Fork (Virtual Machine Fork) simplifies the development and reduces the management burden of cloud applications. VM Fork enables on-demand application scaling by instantly cloning a server into one or more replicas, in mere seconds. The software was released under an open source software licence, and is being commercialized by GridCentric, a Toronto-based start-up founded by UofT grads Lagar-Cavilla and Scannell. Further details regarding their invention and award can be found here. Ryan Johnson has been awarded the 2012 SIGMOD Jim Gray Doctoral Dissertation Award. The annual SIGMOD Jim Gray Dissertation Award recognizes excellent research by doctoral candidates in the database field. Ryan completed his dissertation titled "Scalable Storage Managers for the Multicore Era" at Carnegie Mellon University. The Award mention noted, "Johnson's dissertation is a tour de force in identifying bottlenecks when scaling OLTP systems to many cores, proposing innovative solutions to each of them. The ideas in the thesis such as speculative lock inheritance, new techniques for combining log requests, and data-oriented transaction execution are highly innovative, and the work is remarkable for its breadth, depth, thorough implementation, and evaluation." The paper "Recon: Verifying File System Consistency at Runtime Analysis" by Daniel Fryer, Kuei Sun, Rahat Mahmood, TingHao Cheng, Shaun Benjamin, Ashvin Goel, and Angela Demke Brown won Best Paper at the 10th USENIX Conference on File and Storage Technologies (FAST) in San Jose, California. See more information here. 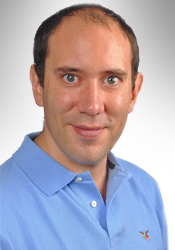 Faculty member Eyal de Lara was awarded a grant by VMware to conduct research on Flexible Computing with VM Fork. The project researches rapid, scale-oud cloning and customizaton of virtual machines, including the issues related to subsequent contraction of resources to enable true elasticity within a cloud environment. Faculty member Eyal de Lara spoke to U of T News about October's Blackberry outage. This summer, Ryan Johnson joined the CSNG as its newest faculty member. Ryan's research focuses on high performance database systems in the context of modern hardware advances, especially multicore computing and solid state (flash) storage. Among other subjects, he is also interested in low-level systems topics that impact database engine design, including computer architecture, operating systems, concurrency, and storage management. Find a profile on Ryan here, and his webpage here. Ryan, welcome to the department! The Province of Ontario's Ministry of Research and Innovation (MRI) announced awards under its Research Excellence, Research Infrastructure and Early Researcher programs on July 25; the U of T earned more than $24.9 million in total. Eighteen researchers were recognized with the Early Researcher Award (ERA), which helps promising newly-appointed researchers build their teams. DCS' Yashar Ganjali was awarded funding for his project titled, "Network management for next generation Internet." His citation reads: "With the amount of data continuing to grow, the Internet is reaching the point where its limitations are becoming clear. At the University of Toronto Dr. Yashar Ganjali is developing technologies necessary for the next generation Internet – work that will help Ontario’s information technology companies play a key role in the future of the industry." See the U of T press release on the MRI awards here; see the ministry's list of U of T ERA recipients here. Interview with Eyal de Lara featured in CBC Radio segment on Cloud Computing. The Spark episode is available here . For the full interview click here. The Natural Sciences and Engineering Research Council of Canada (NSERC) Doctoral Prize recognizes excellence in student research in the natural sciences and engineering. Doctoral Prizes are awarded to up to four students who are completing their doctoral degrees at Canadian universities. Two awards are available in each of the two categories: natural sciences, and engineering and computer sciences. Andres was honored for his research on "virtual machine (VM) fork," a new primitive that will make cloud computing more efficient. The full press release is available here. Roy Bryant featured in Global and Mail article. The Alexander Graham Bell Canada Graduate Scholarships are awarded by NSERC to the top ranked applicants in a competition year. Congratulations Svitlana! Bianca Schroeder's research with Google in Computerworld [October 2009]: "Google: DRAMM error rates vastly higher than previously thought"
Bianca Schroeder on Slashdot [October 2009]: "Google Finds DRAM Errors More Common Than Believed"
Graduate student Stratis Ioannidis in News@UofT [August 2009]: "Social network research nets U of T student big prize"
At this year's ACM Awards Banquet in San Diego, Stratis Ioannidis was awarded 2nd place (Graduate Category) in the ACM Student Research Competition (SRC) for his work "On the Distribution of Content Updates over a Mobile Social Network". Stratis' work received the top honor for student research at ACM Mobicom 2008 conference in San Francisco, and he is one of the three graduate students who qualified for the ACM SRC Grand Finals at the awards dinner. Find more information on the ACM SRC here. Congratulations, Stratis! Bianca Schroeder, with E. Pinheiro and W. D. Weber, won the Sigmetrics Best Presentation Award for "DRAM errors in the wild: A Large-Scale Field Study" at Sigmetrics/Performance 2009 in Seattle, WA. Undergraduate student Philip Patchin, who is working with the SnowFlock research team, was named a recipient of the UofT's annual Cressy Award, which was given to 157 students from across the university. The Cressy Student Leadership Award is given to honour students who have made outstanding extra-curricular contributions to the university. See the article about this achievement here. An impressively large number of CSNG students secured travel grants for the USENIX Symposium on Operating Systems Design and Implementation (OSDI). OSDI, one of the premier conferences in systems, was held in San Diego, California from December 7 to 11. Grant recipients included Roy Bryant, Andrés Lagar Cavilla, Philippa Gill, Ziyad Hatatet, Olga Irzak, Vivek Lakshmanan, Adin Scannell and Amin Tootoonchian. Student teams competed to download a few hundred mega bytes of data from a web server. The three winning teams were MK2 (Beombeyn Kim, Chiwoong Moon and Kyungwon Kwon), The Pings of Death (Ian Chan and George Foncea) and No Name (Kaveh Ghasemloo and Roy Brya). Find more information on the competition here. SnowFlock is a joint project between CSNG and the Computational Biology research groups, and is sponsored by NSERC, Platform Computing, the Ontario Innovation Trust and the Canada Foundation for Innovation. SnowFlock leverages virtual machine technology to enable high performance computing on cloud environments. The project team is pleased to announce the updated version is now available in binary and source code form and includes a queue of bugfixes such as exception handling in the control plane and mpi scalability. Find more nformation on SnowFlock here. On Tuesday, November 25, CSNG hosted the department's first research group Open House. Students, faculty and staff had the opportunity to see research on Operating Systems, Social Networking, Network Security, Mobile and Pervasive Computing, High-Performance Computing, and Wireless Networking. The Open House was a great success, giving the rest of the department a glimpse at some of the great work being done at CSNG. PhD candidate Stratis Ioannidis' work, "On the Distribution of Content Updates over a Mobile Social Network", received the top honour for student research at ACM's 14th Annual Mobicom 2008 in San Francisco this September. Stratis will now go on to compete in the ACM Student Research Competition Grand Finals with his work, which was originally developed during his internship at Thomson Research in Paris, France this past winter. See more information on Mobicom, the Annual International Conference on Mobile Computing and Networking, here. This March, the Canada Foundation for Innovation (CFI) distributed $2.3 million in new funding to the UofT through CFI's Leaders Opportunity Fund. Two projects rewarded with grants are led by DCS faculty members. Yashar Ganjali's funding will help equip the Advance Packet Switch and Network Laboratory. In this lab, research is conducted on high performance packet switch and network systems, supporting research on data communication systems. Stefan Saroiu and Nick Koudas' grant will fund the Social Information Systems Laboratory, which will house research projects aiming to create new Internet search and content delivery technology leveraging online social networks. CFI funding helps ensure that researchers have the necessary tools to conduct leading edge research. To see the UofT announcement about the latest round of CFI grants, go here. To see CFI's complete list of funded projects, go here. VMGL is a project sponsored by NSERC, the Canada Foundation for Innovation, Google and the Ontario Innovation Trust. VMGL enables OpenGL apps running inside a Virtual Machine to take advantage of graphics hardware acceleration. Kernel-based Virtual Machine (KVM) is open source software; a full virtualization solution for Linux on x86 hardware. The VMGL project can be found on the KVM wiki here. Bianca's paper, "An Analysis of Data Corruption in the Storage Stack"	won Best Student Paper at the 6th USENIX Conference on File and Storage Technologies (FAST) in San Jose, California. See more information here. Yashar received support from Cicsco for his work titled "Traffic Burstiness and Buffer Sizing in Internet Routers". See Cisco's funding announcement here.